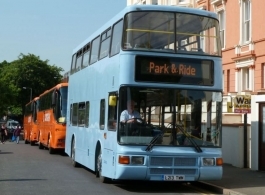 A classic Double Decker Bus available for weddings or any special occasion. If you have a large number of family/guests/friends then these wedding Buses are an economical and unique way of transporting them to and from the wedding venue. These wedding Buses are light Blue in colour and as the seating capacity can vary, they can cater for 61 seated to 67 seated passengers plus 8 - 10 maximum standing passengers. For young children, they are only allowed to sit on adults laps up to the age of 2 years old. Any older than 2 years then they are required to have their own seat which would count towards the overall capacity. Please note that the interior photograph shown is an example of one of the buses, the actual interior of the bus you book may vary.